Milk tea shops which were once only found in Taiwan, have been a common sight in various malls and even on the streets of the Metro. With a continuously growing market, it's just expected that more and more milk tea stores will sprout like mushrooms. However, even with multitudes of milk tea cafés, kiosks and stalls taking the Philippines by storm, only a few managed to captivate my taste buds. 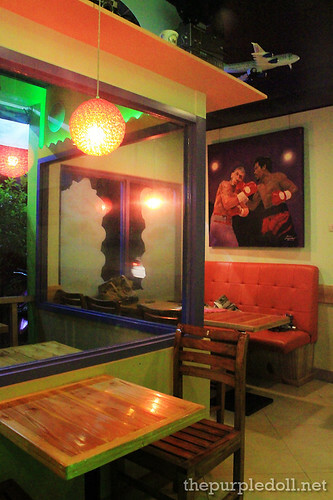 One of which is FrosTea in the Katipunan area. 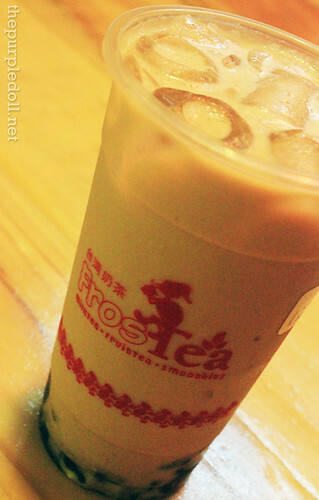 FrosTea is fairly new in the milk tea scene. Having only opened its doors last January, it's still a budding lounge for milk tea enthusiasts like myself. However, FrosTea has already been growing a decent following mostly made up of students in the area. With an extensive line of beverages, a cozy contemporary café atmosphere, and a strong Wi-Fi to boot, it's not surprising that FrosTea is already becoming one of Katipunan's must-try milk tea shops. To give customers more choices, FrosTea doesn't only offer milk teas but also an array of smoothies, fruit and hot teas, rock salt & cheese drinks, as well as yakult-infused beverages. For the tummy, FrosTea also has a selection of the most popular Chinese-style snack items, as well as the most famous Pinoy meal favorites. I honestly love trying out milk tea flavors which I haven't previously had. Fortunately for this FrosTea trip, I was with The Foodies Circle who's equally as adventurous as me so we didn't hesitate to sample two unconventional milk tea items -- Tsim Sha Tsui Red Bean Milk Tea (P95) and Red Bean Milk Tea with Rock Salt & Cheese (P100). Named after a highly urbanized area in Hongkong, TST Red Bean Milk Tea is a smooth and fragrant drink made from freshly-brewed earl grey tea infused with red beans. Although I'm not really a big fan of any type of beans, the clean taste of the milk tea coupled with the slightly sweet flavor of the red beans, won me over. The Red Bean Milk Tea with RSC on the other hand, was also on the same page. 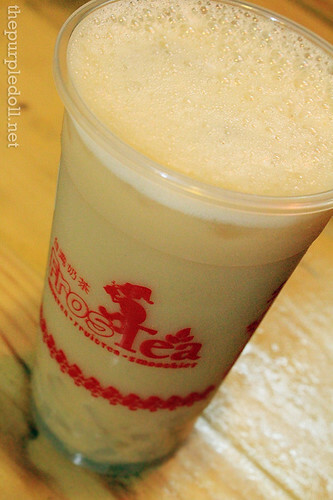 Made from red bean-infused assam black tea, this equally refreshing drink is topped with FrosTea's own version of rock salt & cheese -- a thick cream cheese-like mixture which despite lacking in terms of saltiness, managed to make the milk tea creamier. 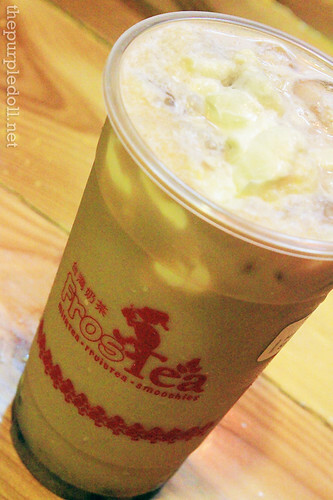 Curious on FrosTea's other offerings, we dared to try the Yakult-Green Tea with Jelly (P90). I'm a big fan of yakult even as a kid, but I found this drink a little too tamed even with the nata de coco jellies. However, I'll definitely order this again when I want to cleanse my palate as its slight tang can do the job well. 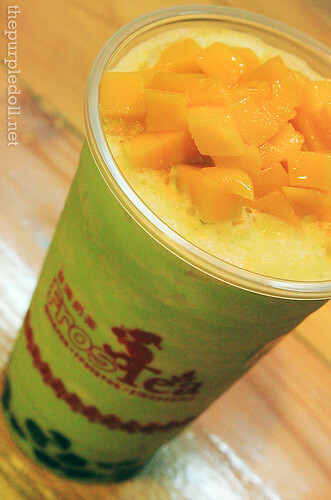 With a bestseller tag, our group didn't dare miss getting the Deluxe Honeydew Smoothie with Mango & Pearl (P100). Even before taking a sip, the fruity aroma was already enticing enough. However, it's the perfect blend of the sweet and tang of the honeydew and mango bits that instantly made me a fan. Of course it would be a sin to miss FrosTea's food items. So to accompany our refreshing beverages, we had a serving of Siomai (P55). Hand-made in FrosTea's own kitchen, these pork bundles of joy were a delight to eat. 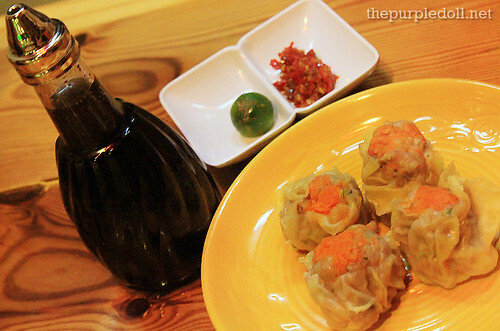 Unlike most siomai from kiosks and even from restaurants, FrosTea's were meaty, tender and oh-so-succulent. With just one bite, I already found myself in love. The same goes with this bowl of Beef Mami (P75). Although simple-looking, I fell in love with its refreshing parsley aroma. 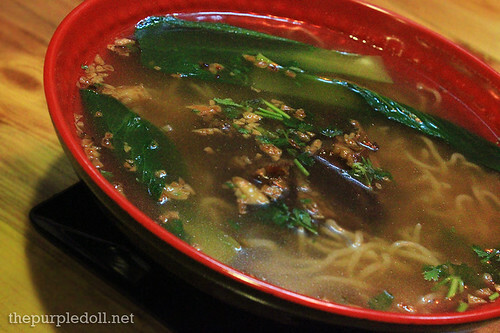 After a big mouthful, it proves to be one flavorful noodle with generously meaty slices of beef and a broth so calming and satisfying. It's already good as it is, but if you want to unlock more of its natural flavors, then a dash of pepper wouldn't hurt. 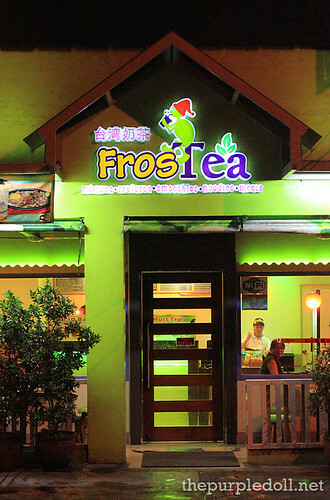 FrosTea may not be as big as some of the international milk tea franchises which currently dominate the market. However, with a wide variety of beverages and food items, a friendly and courteous set of staff, free fast and reliable Wi-Fi, and a relaxing ambiance, all for highly-competitive prices, then I don't see why I shouldn't pay FrosTea another visit. I always passed by this store. But I always hesitated to try it, because I don't know what to order, and I'm afraid that it wouldn't taste good. Now I already have an idea! Thanks! Wow! Looks healthy and affordable... Too bad, I'm far from Katipunan. They're the only shop I've seen that offers Milk Tea Smoothies! Ang ganda kasi di lang drinks meron sila. i never tried milk tea. was it really taste good? Hope i can find milk tea shop here in my place and try it. Another addiction. Halos lahat ng milk tea shop ngayon nag-oofer na din ng foods no?no wonder parang may promo ang starbucks every monday, d kaya natatalo na sila sa milk tea craze? Haven't tried frost tea myself. Thanks for this. Is there any branch around Manila? The prices are so affordable, and I'm curious how that tea with rock salt tastes like. Sounds odd. I agree with Jade MilK tea with dimsum sounds good! I must try their Yakult with jellies. Are their rock salt and cream cheese levels with Happy Lemon's? Gone are the days that tea's can only be drink with hot water and no resto makes it as their main attraction.now you can have them in variety of flavors. I really like to try milktea... I think I would love it. hmmm, yummy fros tea! perfect for summer! Most days I regret living in the province, where there are limited restos to choose from. Wow another milk tea shop here! Super dami na talagang milk tea. Though I think madami nako natry, they're still not enough since madami pang dumadagdag. I am not really into the RSCs. I have tasted one from Happy Lemon and I didn't like it. I more of pearl milk teas, wintermelon and caramel. Milk Tea shops have been mushrooming all over the Greater Manila Area now which is actually cool because when there's more of them there'll be a lot of places to choose and hopefully prices become lesser and lesser. I'd love to try that Yakult Green Tea! Though I'm really a coffee person. Milk Tea with foods :) This is a must try food hub! Nom nom! I love milk tea. I'll try this if ever I pass by that area! I love yakult, i never tun out of it in my fridge, I'm curious about the taste of the Green Tea with Yakult--- have you tried it??? @eigroj: Yes, this entry is actually a food & bev review so I try everything I post.. :) The green tea with yakult is a tamer version of yakult. It tastes a little diluted. Hello Guys! Thank you for your interest in our products. maganda yung place and i like to try the Deluxe Honeydew Smoothie with Mango & Pearl.